By Frank Sinatra. Arranged by Kate Agioritis. Score, Set of Parts. 23 pages. Published by Musika Publishing Australia (H0.421619-713201). 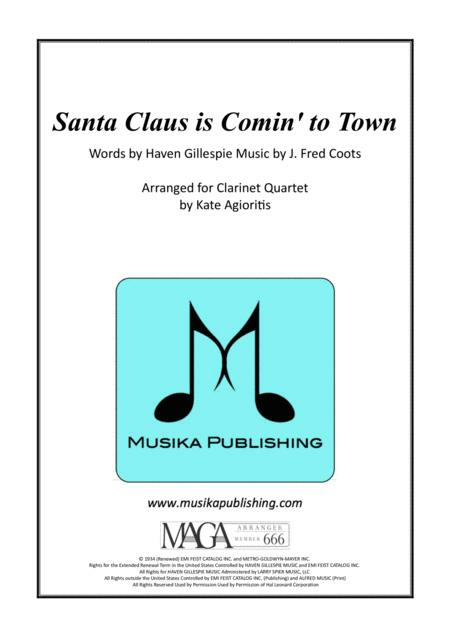 An upbeat, jazz arrangement of Christmas favourite 'Santa Claus is Comin' to Town' for Clarinet Quartet (with optional Alto Clarinet part). View the full catalogue of Musika works on our website: www.musikapublishing.com Follow @musikapublishng on Twitter. LIKE us on Facebook! Subscribe to our YouTube channel!